I’ve been something of a devotee of Luke McCallin’s Reinhardt books since the first one. There was something about the adventures of a distinctly non-Nazi Wehrmacht officer investigating murders in the Balkan territories. It was a region about which I knew little and a time which oddly fascinates me, despite being far from my own era of choice. And interestingly McCallin’s familiarity with the locale and the subject shone through and gave the books great depth and value. I loved both books one and two. I hesitated over book 3. Honestly, despite loving the first two I really hesitated. Because the war has ended after book 2 and that means that book 3 was guaranteed to be vastly different. Ashes of Berlin is set in 1947, in a city that is divided and overseen by an uneasy alliance of British, American and Russian, with the Germans still there and downtrodden or working desperately with one group or another. I couldn’t see this possibly being anywhere near as engaging as the previous two. But… because it’s McCallin and Reinhardt, I went to it anyway. In fairness, it took me perhaps the first 10% of the book to get into it. For a while I thought my doubts had been borne out over the setting. But oddly the plot was still grabbing. And so it pulled me along. And I’m glad it did, because after that initial adjustment, I came to appreciate what a rich setting it is. This world is very different from the wartime Balkans of books 1 and 2, and yet oddly similar in some ways. For Reinhardt, now serving back in the police in Berlin as he once had long ago, he is still beleaguered, untrusting and downtrodden by superiors. They’re just different superiors now. And the brutality and horror of post-war Berlin is every bit the match for the brutality and horror of wartime Sarajevo. McCallin has really pulled out the stops in his research. I cannot imagine how much reading and note-taking he must have gone through for this. But it is a triumph. The plot is actually better than both the first two. Where books 1 and 2 tended to wander a little by necessity, this one is much tighter and more defined. It is also much harder to anticipate. It unfolds slowly and carefully and caught me out numerous times. I like a good mystery and only with a good plot do I start to guess and work out ahead of the reveal. I was wrong. Several times I was wrong. McCallin has thrown so many curve-balls I kept getting hit in the back of the head. There are 3 major triumphs in this book for McCallin. The Plot, which I’ve already mentioned. And there’s no point in me trying to explain any of it, but it starts with a man who drowned on dry land, put it that way. Then there’s the world. The atmosphere, the landscape, the descriptive. It is stunning. It becomes immersive and all-consuming. I felt I came to know 1947 Berlin intimately. But thirdly, there is the matter of character. I’d felt there was nowhere really to grow Reinhardt after the war. Gods, but I was wrong. And he is surrounded by a stunning cast. In particular one American, one Brit and one senior Russian. They are so beautifully drawn and realistic it is hard not to picture them in your head. So there it is. You might have read books 1 and 2 (The Man from Berlin and The Pale House) or you might not. If you haven’t give them a read. If you have, do not be put off by the change of scene with book 3. It outstrips its predecessors. Just read McCallin. He’s a master of the craft. There will be those of you out there who watched Valkyrie and loved it. Traitor’s Gate does the same thing but better. There will be those who hated Valkyrie. Traitor’s Gate is more accurate and more tense. You will prefer it. There will be those who’ve never seen Valkyrie. Don’t bother. Read Traitor’s Gate! I’m not an avid reader of the WW2 era, nor a student of the period, though I’ve delved here and there. I’ve watched a number of movies based on the period, including some from the German point of view, but it’s still far from my comfort zone. To be honest, if a friend of mine had not raved at some point about how good the book was, I would never had picked it up on a whim, needing a change from Roman stuff, and read it. I’m glad I did. Though early on, I realised that this is not strictly speaking a war book. This is a book about people and espionage and the hell that was the Third Reich before the war. This is a tale about a confused and dreadful time during which trust was hard to come by, and humanity even more so. Though the direct protagonist and antagonist are fictional, the story introduces us early on as supporting characters to two key figures in the history of the 3rd Reich, both of whom were already familiar to me. Reinhard Heydrich is one. If you know anything about the period, that name should make you shudder. He was one of the architects of the Holocaust and one of the most brutal and unpleasant people during the war, running the Gestapo. The other is admiral Canaris, head of the German secret service, hero of mine and unsung hero of the war. To be honest, if I’d known it involved Canaris, I might have read it earlier. Essentially, this story tells the dreadful tale of an Englishman in Berlin in 1938 battling with his family loyalties and his conscience in a world rapidly descending into hell. It is refreshing to see a tale that tells of high-powered and intelligent Germans, even in the party itself, understanding that Hitler was bad for Germany as well as for the rest of the world and beginning to put together a plan to remove the Fuhrer from power. A lot of the story relies on secret negotiations between high level anti-Nazi Germans and peripheral members of the British government, arranging to carry out a coup against Hitler should the Fuhrer decide to invade Czechoslovakia despite British and French opposition. 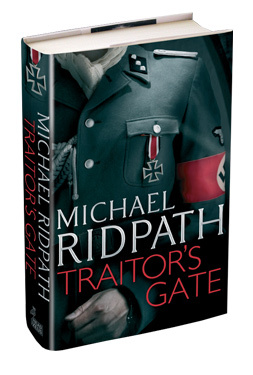 Traitor’s Gate is a tremendously tense novel, building up with the crescendo of Nazi power in the days before the annexing of the Sudetenland. For those of you who’ve seen Valkyrie, it carries the tense moments of planning the coup in at least as stunning a manner – better, in fact. Despite the fact that even the least informed reader will go into the meat of the novel already aware of the fact that Hitler did not in fact die in 1938, and therefore we know that any plot failed, the novel is so well written that it is impossible not to be swept up in the tension and hope against hope that somehow the plot succeeds. Impressive, that. In addition to the plot concerning a potential removal of Hitler from power, the story is cleverly interwoven with another thread involving a woman with Jewish ancestry (you can guess the direction that one’s taking.) This allows Ridpath not only to explore aspects of divisions in the higher ranks of the Third Reich and grand moral and political concerns, but also to investigate and reveal the deeper, more personal effects of the rise of Nazi power on the ordinary people of Germany. I gave to say that at least one anecdote told in relation to this thread will stay with me for a long time. So… the characters are extremely well constructed and smoothly filtered in among real personages of the era, all of whom are excellently portrayed. The feel of the book is utterly atmospheric. It is like stepping into the page and finding yourself in just pre-war Berlin. The plot is tightly-constructed and builds continually to an impressively tense conclusion (especially given the foreknowledge that Hitler doesn’t die!) Clearly Ridpath’s research has been spot on and his storytelling is impeccable. I simply cannot recommend this book highly enough. It is exactly the sort of book I would not have thought to read, and I would have missed out. Don’t make the same mistake. This will most definitely hit my top ten of the year. Go get it and read it. You will NOT be disappointed. Oh, and, currently at £2.19 on kindle it’s also a bargain! Here’s his website. Here’s the Amazon.com and Amazon.co.uk listings. And here’s his twitter handle.